Based on the legendary Hammerfall PCI Core with its innovative zero CPU load technology the new Hammerfall DSP PCI Core is even more optimized for more performance. Thanks to the latest chip technology internal hi-speed RAM can be used faster and more efficient than external SRAM. Furthermore the PCI card includes two Sync-connectors for synchronization of multiple interfaces. You have a choice to connect the PCI card to either the Digiface or the Multiface for different input/output options. 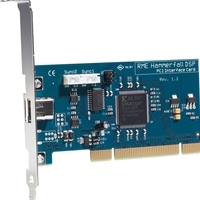 The Hammerfall DSP PCI interface can only be used with the Hammerfall DSP breakout boxes. The PCI engine of the Hammerfall DSP System is built on a zero wait state PCI Busmaster core. With up to 130 MB/s transfer rate in both directions the maximum performance available on the 32 bit PCI bus is used. Additionally the card offers highest compatibility by being 100% Plug & Play compatible under Windows and MacOS, and being able to share interrupts. The card itself will only use one interrupt (IRQ) for all functions (audio/MIDI). The connection between PCI card and I/O box is established using ordinary firewire cable (IEEE 1394, 6-pole). The data transfer does not use Firewire protocol, but our own proprietary bus protocol. The supplied cable is 4.5 m (14 ft.) long, a cable length up to 10 m (33 ft.) has been successfully tested. The PCI card operates as power supply for the attached I/O-box. Operating system: Mac OS 8.6 or higher, OS X 10.2 or higher.